Security and Value for your home. Let us provide you with peace of mind and a quick solution to your rodent problem. Not only will you see immediate results as the mouse infestation disappears from your home or property, but you'll know that you are poisoning only mice - not children or pets! Our pack of mouse bait stations will discreetly kill your mice and restore peace to your home. We've also included a couple of nifty bonus items with your purchase because we believe in providing you with as much value as possible. So, click the buy button above and watch your mouse problems melt away! 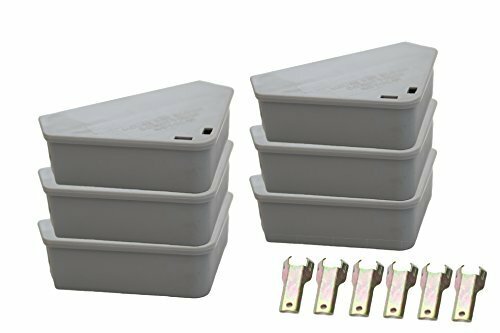 SECURITY AND VALUE FOR YOUR HOME; our 6 pack of mouse bait stations is your safe and permanent solution to all of your mouse problems. PROTECTS CHILDREN AND PETS; tamper resistant design keeps poison away from children and pets; locking lid opens with special key for easy inspection and refill. BEST VALUE FOR YOUR MONEY; with your 6 bait stations you receive 6 additional unlocking keys and 2 reusable ant poison stations; NO BAIT IS INCLUDED. POISON MICE ANYWHERE; triangular shape and low profile make this rodent bait station perfect for baiting in tight spaces, corners, and under furniture; tight sealing lid keeps bait dry outdoors. COMPACT AND INCONSPICUOUS; bait station measures 5 inches long by 3.5 inches wide by 1.25 inches tall and comes in quiet grey color, designed to blend in with decor. If you have any questions about this product by Venditor, contact us by completing and submitting the form below. If you are looking for a specif part number, please include it with your message.